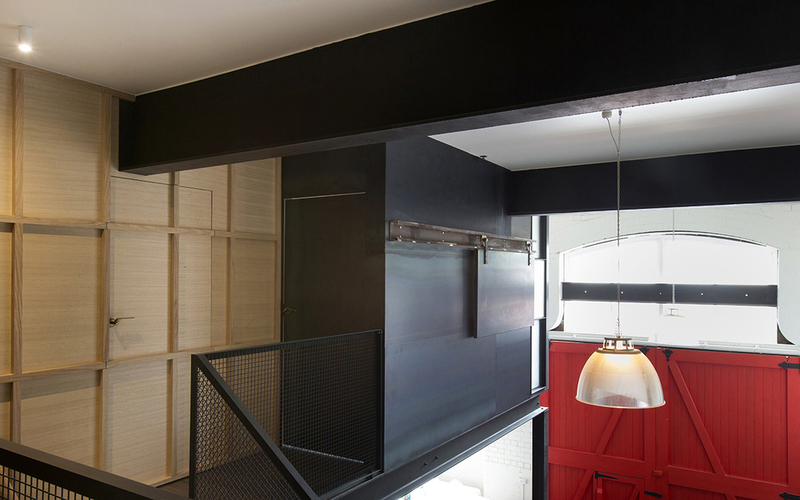 Snapshot: Born of "a series of unfortunate conversions," the Tinderbox is Breathe's Architecture elemental reconfiguration of an apartment within an 1887 Melbourne warehouse. Its titular theme provides the components of a fire-based design narrative: black flint and rigid steel spark into yellow and red accent surfaces and fade back into charred-black wood. It's the minimal detail that often focuses the eye - a geometric faucet, its chrome finish mirroring off one perpendicular joint. Two elements are now in play, the mirrored steel surface and the sharp, geometric line. This angle finds visual repetition in the open-slat staircase that joins the double-height space, continuing throughout the sharp lines of the space. The sheen of the faucet reflects in an adjacent steel fume column, then dances in the natural reflections of a coal-tinted refrigerator door. 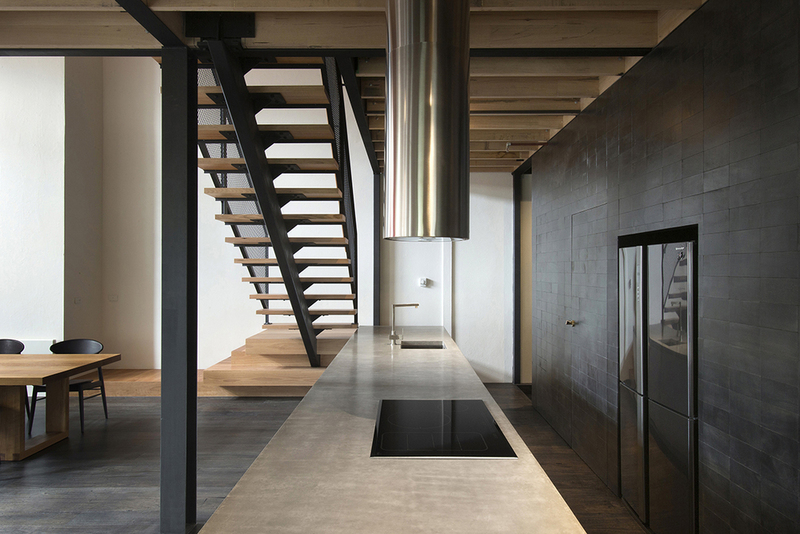 Here the black enters, with charred-black tiles lining the kitchen wall, and strong, vertical steel columns leading the eye upwards to an airy entresol. The final element is a clean, light-hued natural wood surface, planked into the flooring, walls, and accenting simple pieces of furniture. These elements compose the tools of a tinderbox: flint, char cloth, and a fire striker. As the architects describe, the "18th century fire starter kit inspired a material narrative," one in which the elemental qualities of each implement - the steel of the striker, the oily black of the char cloth, the grey-black texture of the flint - combine to create a potentiality of space. This potentiality is inherent in the materials, sparking out from the deliberate joining of each element. 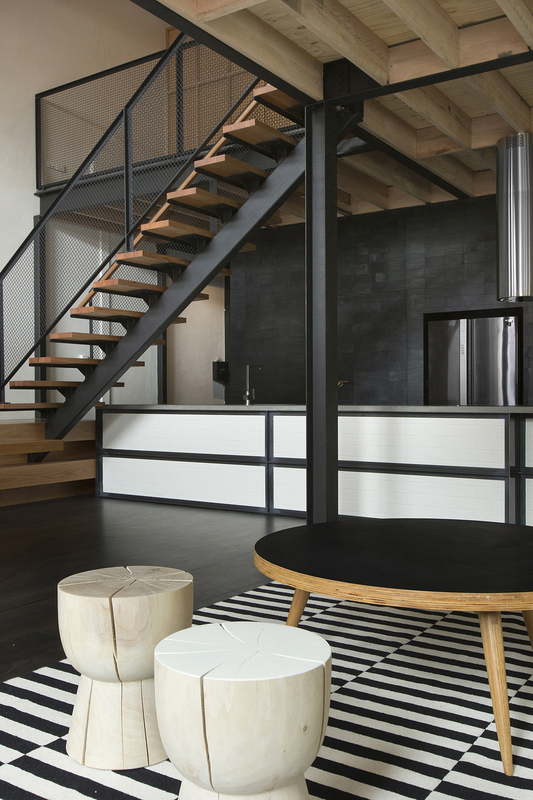 In this space, the black-coated steel and clean wood create a phoenix-like tone: wood is fuel for fire, black is the charred result. Out of the skeleton of an historic space - the black steel columns and rails girding the entresol - grows new life and vitality in minimal wood surfaces. The light hue and simple texture of the wood feels fresh and reflects the airy, natural-lit space. With the strength of the primal architectural elements - steel and wood - the architects chose to add only a handful of accents. 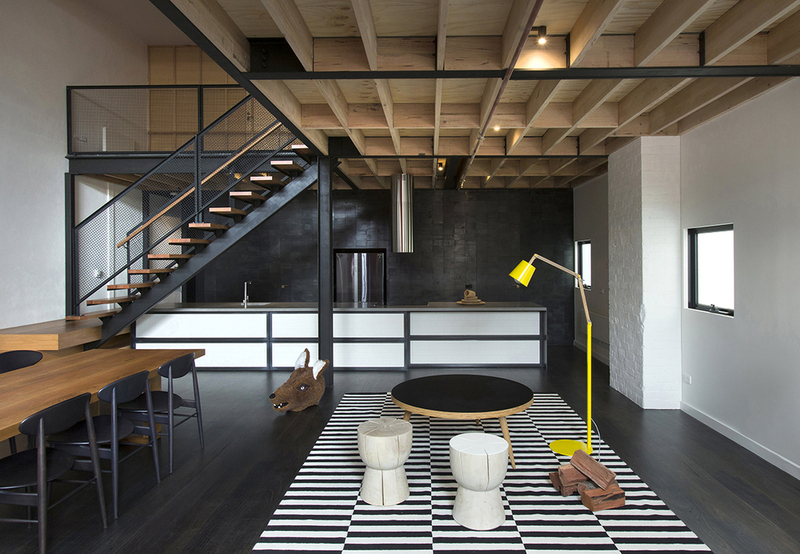 Here, a Daniel Buren-like carpet creates visual interest with black-and-white panels. This contrasts a dark-washed wood floor, the hue of which intones ash and the age of the building. 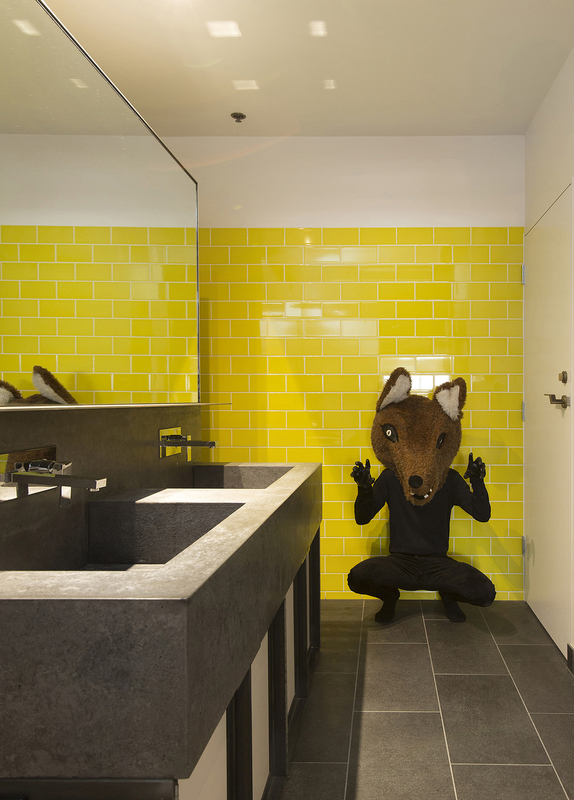 Yellow tiling in the washroom adds a lemon zing, like the spiciness of saffron in an oft-overlooked space. Finally, the entryway and wood-plank entry door are thick-coated in firehouse red, an overt reference to the narrative of fire in addition to its connection to passion - to the fury of a full-on blaze. The particular challenge of architects reconfiguring historic spaces - and one which is well worth fulfilling - is sustainable practice in adaptive reuse of the space. Breathe Architecture describes their mission as a weaving of aesthetic principles with environmental principles. The Tinderbox house uses the entresol as an ingenious pathway for cross ventilation and access to natural light. The double-height allows for an airy and eponymous connection of spaces. Finally, Breathe's focus on not only resilient, but low toxicity, locally-sourced materials prove their commitment to sustainable practice while yet creating a fascinating space. One need only look to Andrew Wuttke's fantasy-driven photographs of the space to uncover its narrative. A phoenix feathered in wood and steel, this apartment is born of fiery inspiration, a sustainable solution to a once lackluster warehouse.